"You said you want freedom. It's time you learn that freedom's never a gift; it has to be earned." Now more than 20 episodes into the series, the central Star Trek actors have started to grasp the key elements of each individual. Tomorrow is Yesterday lacks the usual evil force or alien being, and this leads to a unique, yet fairly light-hearted episode. While the fate of the world's future is at stake, everything has a more lowkey approach that differs from the tense encounters of other entries. An encounter with a black star (now known as a black hole) shoots the Enterprise back into time to the 1960s. They immediately encounter the flight of Air Force Captain John Christopher and must beam him aboard to save his life. Spock (Leonard Nimoy) quickly realizes that returning him to Earth could alter the face of time and possibly eliminate their future existence. This provides Kirk (William Shatner) with a dilemma concerning the fate of this likable young pilot. This episode offers a few silly moments that spice up what could play as straightforward drama. After repairs on a planet inhabited by females, Kirk's computer speaks with a suggestive, sultry tone. Deforest Kelley has some classic moments while growing bewildered with Spock's logical outlook on each situation. There's also a nice scene involving another sergeant accidentally transported to the ship. Once he's beamed aboard, he stands completely still while Spock and the others discuss his unfortunate situation. It's nice to see Sulu (George Takei) receiving a larger workload on Tomorrow is Yesterday. When Kirk journeys to the surface to destroy files related to their appearance, Sulu joins him to carry out the deed. Uhura (Nichelle Nichols) also makes a brief appearance sporting an extremely short skirt. The conclusion of this episode is a precursor to the flight around the sun in Star Trek IV: The Voyage Home. Although this entry showcases much simpler action with laughable models, it still offers a nice connection to one of the most popular feature films in the series. The crew is back fighting a powerful, unseen force in this episode that strikes a tight balance between hokiness and impressive originality. Kirk, Spock, McCoy and others must explore Beta III and attempt to uncover the mystery of the disappearance of the U.S.S. Archon. This planet's inhabitants are pale, mindless drones who lumber down the streets with giddy smiles of happiness, but they possess no individuality. Controlled by a strange being named Landru, they exist only to do his bidding and live in a world of "joy, peace, and tranquility." This entry sports some of the odder moments of the Star Trek series. At exactly 6:00 p.m., the lifeless beings go crazy and being fighting and tearing up the city. The once-kindly gentlemen grab girls, set fires in the streets, and bash windows throughout the city. Labeled the "festival," this chaos is shot impressively by director Joseph Pevney to reveal the mindless insanity of the events. On the next morning 12 hours later, the people resume their earlier dispositions with hardly an indication of the wild night. Considering the budget limitations of the series, this set design is surprisingly interesting. The buildings and costumes resemble a town from the later Western genre with very proper attire. Once inside Landru's residence, however, the emphasis shifts to the colorful look of 1950s' science fiction films. There are also eerie hooded figures dressed in cloaks who speak in booming voices and carry strange rod-like weapons. These creations help to generate an inventive atmosphere that adds to the entertainment value of this episode. The Return of the Archons also includes some enjoyable acting from Takei and Kelley, who both have fun playing confused automatons. Kirk and Spock utilize some effective logic at the clever conclusion to a top-notch episode. Although it contains a goofy Invasion of the Body Snatchers-type premise, this piece succeeds due to a tense, compact story. 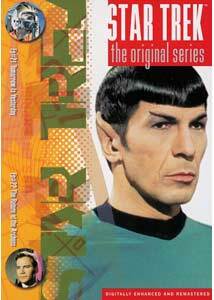 Image Transfer Review: This disc contains the typical original, full-frame format as the other volumes in the Star Trek series. Both episodes feature impressive colors and a cleaned up picture that offers a top-notch viewing experience. A few minor defects do arise sporadically, and some grain does appear, but these problems lack too much significance because of the limited source material. Audio Transfer Review: The familiar sounds of buzzers on the ship and the phasers spring nicely from this impressive 5.1-channel Dolby Digital transfer. The effects have decent power, and this adds to the entertainment value of each episode. The complexity falls well short of audio tracks on releases of newer films/shows, but this is expected because of its television origins. This transfer provides the usual top-notch experience of this popular DVD series. Extras Review: This disc offers the original television previews for both episodes. They run for one minute and come in decent full-frame transfers. English subtitles also are available. Although neither entry on Star Trek: The Original Series—Volume 11 is one of the best of the series, they both present interesting, well-written scenarios for the crew to encounter. Both devout and casual fans are advised to pick up this release for two enjoyable and completely different episodes.